Everyone knows that the Internet is ‘hot’. But what most people do not realize is how important it is to the world economy. This is confirmed in McKinsey’s new report that was released last month at the eG8 Forum. 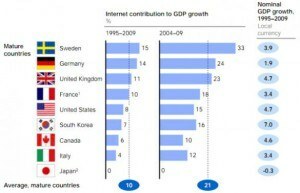 The Internet is essential for the economic growth. 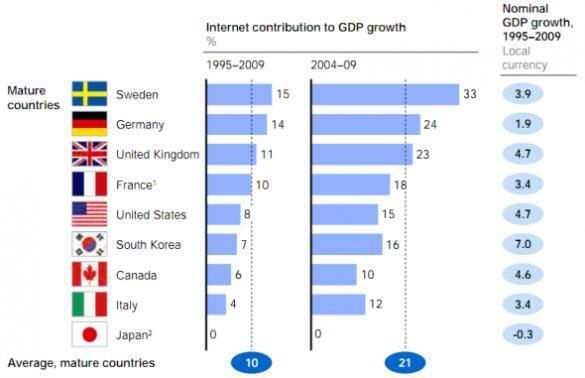 The Internet sector represents about 3% of the GDP, which is more than the agriculture or the energy sector. It represents more than 20% of the economic growth in the past 5 years and keeps growing. For every traditional job that the Internet makes disappear, it creates 2.6 new jobs for the Internet.